We all need a little inspiration now and then to tackle something new, study harder, get to the gym or make a sales call. If you want a true example of inspiration read on. The following email was sent to me by my dear friend. She and her husband have a love of surfing, thanks to the Indo Jax Surfing School in Wilmington, NC. After learning of outreach surf charities they were inspired to provide children with Cancer the opportunity to learn the joy of surfing. 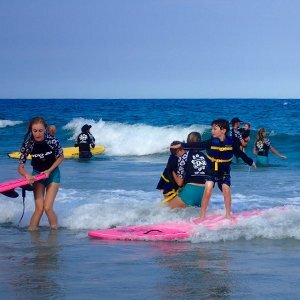 Rather than think about their personal battle with cancer, they teamed up with the Indo Jax Surf School and helped to facilitate the 1st Annual Childhood Cancer Surf Camp. I hope you are inspired by this example of love, kindness and perseverance. For more information please click the following links.